Pearl Jewellery Company specializing in vivid colours of pearls, drop in to shop for exquisite designs of accessories made with Tahitian Pearls. The Tahitian pearls are famous for their distinct black colour which is due to the black lip oyster (Pinctada margaritifera). You can also observe the techniques of pearl farming and the owner will happily tell you the tale behind each pearl and how it was created and showcased. The pearl farm now also operates as an educational centre and you can observe the work done to create a fantastic piece of jewellery. There is also a workshop tour where you can learn do craft it yourself! The farm visit and the workshop tour may have schedule and prices. 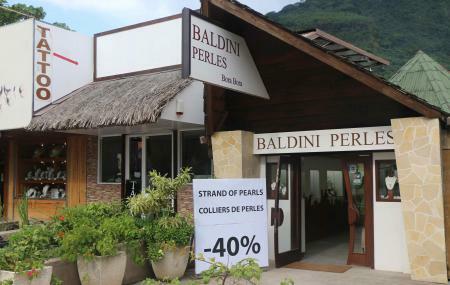 How popular is Baldini Perles? People normally club together Bora Bora Lagoonarium and Leopard Rays Trench while planning their visit to Baldini Perles.